In 1992, Mike Boehm, a veteran of the American war in Vietnam, returned to Vietnam for the first time since the war. This trip profoundly changed his life and led to his lifetime commitment to help the poor people of Vietnam. Shortly after Mike’s return from Vietnam he and others from Madison, Wisconsin, concerned about the aftermath of the war on the people of Vietnam attended a presentation by Carol Wagner from Global Exchange. Carol had led a study tour of women to Vietnam in the fall of 1992 and gave a presentation at Madison Quakers Meeting House shortly afterward. At the end of the presentation Carol told the audience that she and her delegation had received a proposal from the Quang Ngai province Women’s Union to fund a micro-credit program for the poor women of My Lai. She said that while Global Exchange certainly philosophically supports micro-credit programs they don’t fund them and would we take over this project. This began the Madison Indochina Support Group—the first incarnation of the organization that eventually became Madison Quakers, Inc. Mike Boehm was asked to take the lead on this project and the following year, 1993, was spent raising funds for the My Lai Loan Fund through garage sales and other small fund raising events. Mike’s mother, Jenny, had a bake sale in Mauston which raised more money for this loan fund. 1993 was also the year that a North Vietnamese Army veteran, Nguyen Ngoc Hung, visited the U.S. where he met Mike and from that meeting came the idea for a peace park to be built north of Hanoi. On January 10, 1993, during Mike’s return to Vietnam, he delivered the funds requested by the Quang Ngai province Women’s Union for the My Lai Loan Fund. Two weeks previously Mike had met Vietnamese veterans organizations in Hanoi to discuss the concept of a peace park to be built north of Hanoi. Mike returned to the U.S. with a Memorandum of Understanding, the provisional contract used for joint ventures in Vietnam, for the Vietnamese-American Peace Park. Because of the potential sensitivity of this project it was decided that the Madison Indochina Support Group be laid down and an organization well known and trusted take its place. The Madison Quakers were approached and asked to be fiscal sponsors for this project and after some deliberation they agreed. Within a year the Madison Quakers had become fiscal sponsors for all our projects in Vietnam. 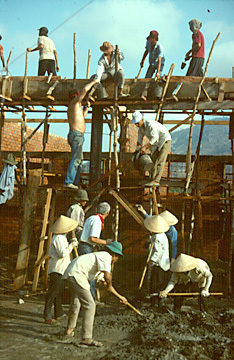 Over the years a number of Madison Meeting members have visited Madison Quakers, Inc. projects in Vietnam. These have included Betty Boardman, Glenn Clark, Joann and Joe Elder, Gil Halsted, Jim and Louise Lund, and Sue and Todd Kummer. While these projects are no longer under the care of the Madison Quakers, the Meeting still strongly supports these projects through contributions and fund raising events. Reconciliation: Americans and Vietnamese working side-by-side build a medical clinic.